Mustang is a Tibetan lost valley and stands as a hidden treasure of Nepal. Trekkers can enjoy visiting the Tibetans there and the most mystic landscape. It seems that “Mustang” is an independent itself as the regional king “Mustangee Raja” is still ruling the area. Situated in the north from Annapurna in at head of Kali Gandaki, it is a Tibetan region inside Nepal. Here, Arts, Thankas, big statue of Buddha and religious heroes are preserved cultural from the sixteenth centuries. It is a walking destination after a magnificient flight by twin otter aircraft from Pokhara to Jomsom and arrives to Lo - Manthang – the capital of Lo. The journey arrives here passing through incredible rocky necks and beautiful landscape of high Tibetan plateau. Day 01: Arrival at Kathmandu. Day 02: Kathmandu – Sightseeing. Day 03: Kathmandu – Pokhara by bus. Day 04: Pokhara – Jomsom by flight and trekking to Kagbeni 2810 m.
Day 10: Lo Manthang – Exploring around. Day 11: Lo Manthang – Exploring around. Day 15: Kagbeni – Jomsom 2700 m.
Day 16: Jomsom – Pokhara by flight. Day 17: Pokhara – Kathmandu by bus. 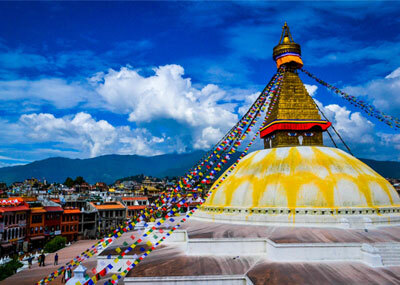 Day 18: Kathmandu – Sightseeing. Day 19: Departure from Kathmandu. These are hotels where normally we accommodate our clients. It is possible to make arrangement of hotel accommodation as per decision and interest of clients. Transport by car during sightseeing in Kathmandu. Guide in English during sightseeing in Kathmandu. Transportation by tourist bus Kathmandu – Pokhara – Kathmandu. Accommodation in standard hotel, Kathmandu on B. B. basis. Accommodation in standard hotel, Pokhara on B. B. basis. Accommodation in basic teahouses during trekking. Full board basis during trekking (breakfast, lunch, dinner with tea/coffee excludes other drinks). Professional trekking guide (English Speaking). Porter/s (One porter for 2 trekking and 10 – 12 kgs per trekker). Equipment: down jacket and down sleeping bags. Trekking permits: Special trekking permit, TIMS, ACAP Entry permit. Personal insurance for Nepalese staffs. Bar bills (any alcohol drinks, mineral water, cold drinks, cigarettes, etc). Lunch and dinner in Kathmandu and Pokhara.